Prompt for today is....favorite fandom object. This prompt was given to me by the lovely aravishermione. Oh that's awesome!! 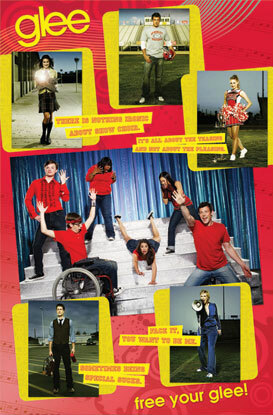 Omg I was so obsessed with Glee when it came out too. In my teen skating class I taught back then we used to sing (these kids had been in the class forever and we used to do stupid stuff like sing) and every week someone would belt out "Don't stop believing...." and the whole class would follow along. Haha, that's amazing! Yeah, my friend and I used to do singing and dancing with a lot of the glee songs up in one of our hay storage areas. It was so much fun! I had this poster up in my dorm room freshman year! Oh how much I loved it back then.